Heart and Sole: A hike beside the - River? For half of today's hike I walked between the unincorporated town of Avon and the Atlantic Ocean. Where's the river? The name 'Avon' derives from the Celtic word for river. So why did they name a town on a strip of sand 'River' when the nearest real river is 50 miles across Pamlico Sound on the mainland? Well, the Gulf Stream is sometimes called the greatest river on earth, but that's not directly offshore of Avon, and in any case that has nothing to do with the origin of the town's name. Avon was originally called Kinnakeet - a beautifully quaint name from the coastal Algonquian (Croatoan) language meaning 'Place that juts out (into the water)'. Then along came the heavy-handed government bureaucrats. When the US Postal Service began to serve Hatteras Island in the late 1800's they came through and arbitrarily assigned names to most of the towns. Even the odd name of Rodanthe was assigned to it by the feds - that village's original name was another beautifully descriptive First American name: Chicamacomico - 'place that is swept (by the wind)'. But back to the name 'Avon'. Have you ever heard of the River Avon? William Shakespeare was born beside the River Avon in the town of Stratford (upon Avon). Well, there are actually four different rivers in England named River Avon, and two more in Scotland, one in Wales (River Afon), not to mention two in Canada, two in New Zealand and four in Australia. What were these English speaking tautologists thinking? Naming their river 'River River' - not just once but fifteen different times. Sheesh. It's like calling the mountain at the northern terminus of the Appalachian Trail 'Mount Katahdin'. Katahdin is another of those wonderful organic Native American place names - it means 'Greatest Mountain'. Only an ignorant westerner would name a place 'Mount Mountain'. Okay, mentioning the Appalachian Trail reminds me that this post is supposed to be about today's hike. I rambled on a bit because there isn't much else to say about the hike or about the town of Avon. 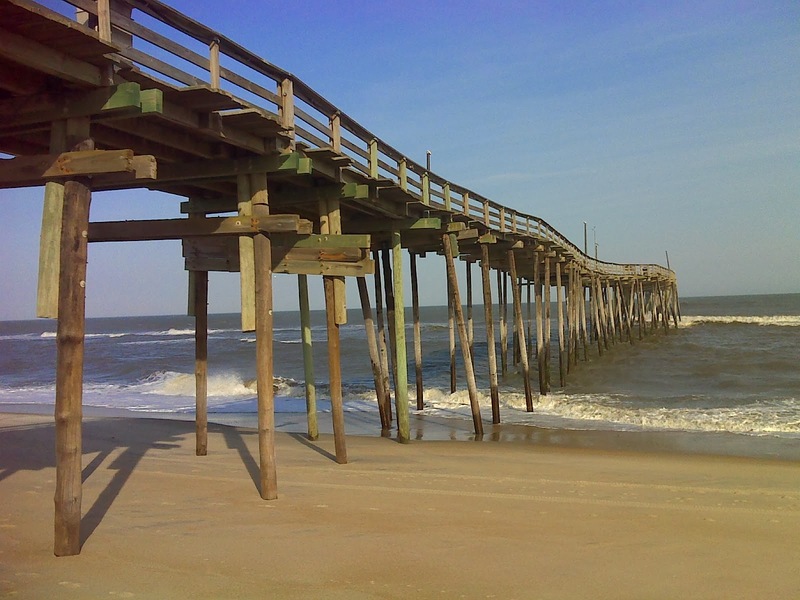 If possible, it's fishing pier is even more rickety than the Rodanthe/Chicamacomico one. It's platform undulates up and down and leans dangerously to one side or the other along most of its length. Although the weather was warm, there were thunderstorms until 9:30AM and a gale warning posted for the waters offshore for the rest of the day. It was so windy that it was hard to appreciate the warmth. So because of that and my late start to avoid the rain, I hiked only 11 miles - all on the beach, most of it as beautiful and untouched as the picture above (note not a single footprint). 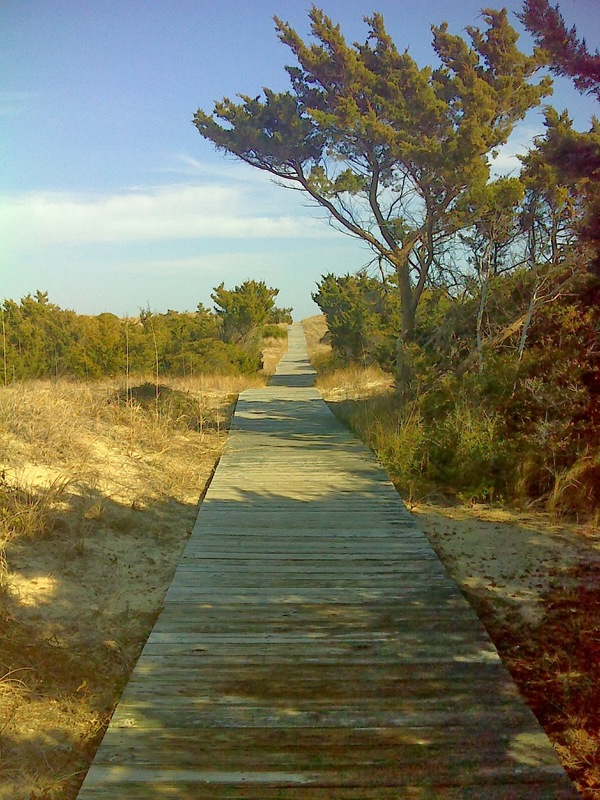 The only other photogenic piece of 'trail' was the pretty boardwalk, not part of the MST, that I used to access the beach from the Park Service paved parking lot just north of the River ... uh ... I mean Kinnakeet. And there is a story in this picture too, about white man's heavy hand. In pre-Columbian times this walk would have been through the dense shade of a majestic Maritime Forest rich with pines and evergreen broadleafs. But shipbuilders and other interests cut down the trees. Sometimes European villagers would clear cutting the land around them just to avoid the threat of predators. The result of the clear-cutting was that the sand began to shift in the relentless wind. And the shifting sand prevented new forest from establishing. 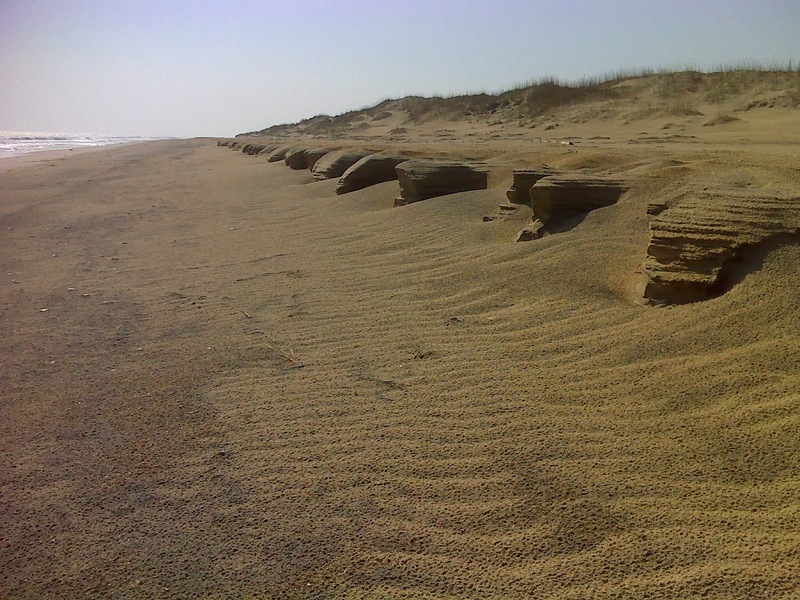 The result is more coastal erosion and a relatively sterile shrub-desert ecosystem. (yes, there are even cacti growing in the sand). So our little town of 'River' is actually in a man-made mini version of the Sahara Desert (which was also once a lush and verdant place). Sometimes I'm embarrassed to admit that I'm part of a culture that can be so self-importantly stupid.